Abby just had a throat infection. After she was deemed to have recovered from the illness, Abby started going to school again. Four days after, Abby’s mother noticed that her daughter’s urine is darker than normal. Abby also went down with fever that night. The next day, she was brought to the pediatric clinic and was discovered to have acute glomerulonephritis. Hippocrates originally described the natural history of acute glomerulonephritis (GN), writing of back pain and hematuria followed by oliguria or anuria. Richard Bright (1789-1858) described acute GN clinically in 1827, which led to the eponymic designation Bright disease. With the development of the microscope, Theodor Langhans (1839-1915) was later able to describe the pathophysiologic glomerular changes. 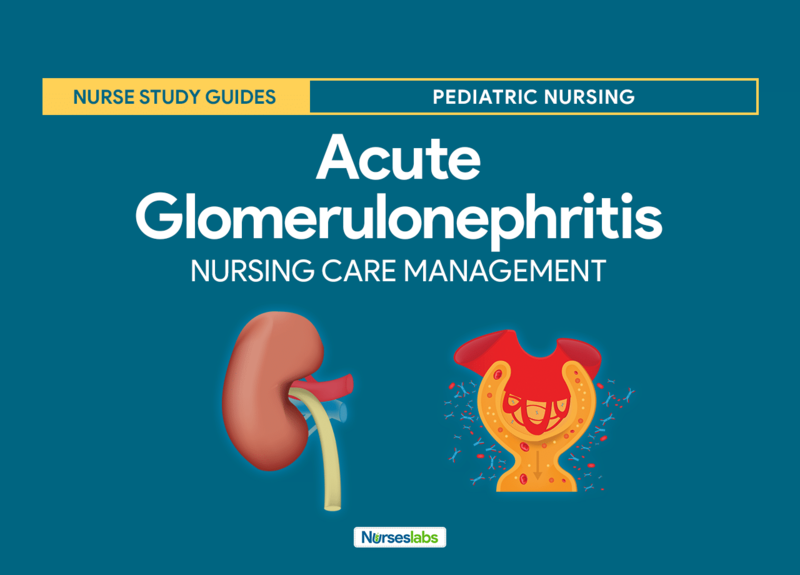 Acute glomerulonephritis (GN) comprises a specific set of renal diseases in which an immunologic mechanism triggers inflammation and proliferation of glomerular tissue that can result in damage to the basement membrane, mesangium, or capillary endothelium. Acute GN is defined as the sudden onset of hematuria, proteinuria, and red blood cell (RBC) casts in the urine. Acute GN is a condition that appears to be an allergic reaction to a specific infection, most often group A beta-hemolytic streptococcal infection. Acute Glomerulonephritis involves both structural changes and functional changes. Structurally, cellular proliferation leads to an increase in the number of cells in the glomerular tuft because of the proliferation of endothelial, mesangial, and epithelial cells. The proliferation may be endocapillary (i.e., within the confines of the glomerular capillary tufts) or extracapillary (ie, in the Bowman space involving the epithelial cells). In extracapillary proliferation, proliferation of parietal epithelial cells leads to the formation of crescents, a feature characteristic of certain forms of rapidly progressive GN. Leukocyte proliferation is indicated by the presence of neutrophils and monocytes within the glomerular capillary lumen and often accompanies cellular proliferation. Glomerular basement membrane thickening appears as thickening of capillary walls on light microscopy. Electron-dense deposits can be subendothelial, subepithelial, intramembranous, or mesangial, and they correspond to an area of immune complex deposition. Hyalinization or sclerosis indicates irreversible injury. These structural changes can be focal, diffuse or segmental, or global. Functional changes include proteinuria, hematuria, reduction in GFR (ie, oliguria or anuria), and active urine sediment with RBCs and RBC casts. The decreased GFR and avid distal nephron salt and water retention result in expansion of intravascular volume, edema, and, frequently, systemic hypertension. Acute Glomerulonephritis represents 10-15% of glomerular diseases. Acute GN has a peak incidence in children 6 to 7 years of age and occurs twice as often in boys. In the United States, GN comprises 25-30% of all cases of end-stage renal disease (ESRD). About one fourth of patients present with acute nephritic syndrome. Worldwide, IgA Nephropathy (Berger disease) is the most common cause of GN. In Port Harcourt, Nigeria, the incidence of acute GN in children aged 3-16 years was 15.5 cases per year, with a male-to-female ratio of 1.1:1; the current incidence is not much different. A study from a regional dialysis center in Ethiopia found that acute GN was second only to hypovolemia as a cause of acute kidney injury that required dialysis, accoujting for approximately 22% of cases. Postinfectious GN can occur at any age but usually develops in children. Most cases occur in patients aged 5-15 years; only 10% occur in patients older than 40 years. Acute GN predominantly affects males (2:1 male-to-female ratio). The causal factors that underlie acute GN can be broadly divided into infectious and noninfectious groups. Infectious. The most common infectious cause of acute GN is infection by Streptococcus species (ie, group A, beta-hemolytic). Noninfectious. Noninfectious causes of acute GN may be divided into primary renal diseases, systemic diseases, and miscellaneous conditions or agents. Presenting symptoms appear 1 to 3 weeks after the onset of a streptococcal infection. Hematuria. Usually the presenting symptom is grossly bloody urine; the caregiver may describe the urine as smoky or bloody. Periorbital edema. Periorbital edema and/or pedal edema may accompany or precede hematuria. Fever. Fever may be 103°F to 104°F at the onset but decreases in a few days to about 100°F. Hypertension. Hypertension occurs in 60% to 70% of patients during the first 4 or 5 days. Oliguria. Oliguria (production of a subnormal volume of urine) is usually present, and the urine has a high specific gravity and contains albumin, red and white blood cells, and casts. Fluid overload. Observe for periorbital and/or pedal edema; edema and hypertension due to fluid overload (in 75% of patients); crackles (ie, if pulmonary edema); elevated jugular venous pressure; ascites and pleural effusion (possible). Cerebral symptoms. Cerebral symptoms consisting mainly of headache, drowsiness, convulsions, and vomiting occur in connection with hypertension in a few cases. There are a lot of renal syndromes that may mimic the symptoms of acute GN, so accurate assessment and diagnosis is essential. Initial blood tests. A CBC is performed; a decrease in the hematocrit may demonstrate a dilutional anemia; in the setting of an infectious etiology, pleocytosis may be evident; electrolyte levels are measured (particularly the serum potassium), along with BUN and creatinine (to allow estimation of the glomerular filtration rate [GFR]); the BUN and creatinine levels will exhibit a degree of renal compromise and GFR may be decreased. Complement levels. Differentiation of low and normal serum complement levels may allow the physician to narrow the differential diagnosis. Urinalysis. The urine is dark; its specific gravity is greater than 1.020; RBCs and RBC casts are present; and proteinuria is observed. Streptozyme tests. The streptozyme tests test includes many streptococcal antigens that are sensitive for screening but are not quantitative, such as DNAase, streptokinase, streptolysin O, and hyaluronidase; the antistreptolysin O (ASO) titer is increased in 60-80% of patients; increasing ASO titers or streptozyme titers confirm recent infection. Blood and tissue cultures. Blood culture is indicated in patients with fever, immunosuppression, intravenous (IV) drug use history, indwelling shunts, or catheters; cultures of throat and skin lesions to rule out Streptococcus species may be obtained. Treatment of acute glomerulonephritis (AGN) is mainly supportive, because there is no specific therapy for renal disease. Diet. Sodium and fluid restriction should be advised for treatment of signs and symptoms of fluid retention (eg, edema, pulmonary edema); protein restriction for patients with azotemia should be advised if there is no evidence of malnutrition. Activity. Bed rest is recommended until signs of glomerular inflammation and circulatory congestion subside as prolonged inactivity is of no benefit in the patient recovery process. Long term monitoring. Long-term studies on children with AGN have revealed few chronic sequelae. The goals of pharmacotherapy are to reduce morbidity, to prevent complications, and to eradicate the infection. Antibiotics. In streptococcal infections, early antibiotic therapy may prevent antibody response to exoenzymes and render throat cultures negative, but may not prevent the development of AGN. Loop diuretics. Loop diuretics decrease plasma volume and edema by causing diuresis. The reductions in plasma volume and stroke volume associated with diuresis decrease cardiac output and, consequently, blood pressure. Vasodilators. These agents reduce systemic vascular resistance, which, in turn, may allow forward flow, improving cardiac output. Calcium channel blockers. Calcium channel blockers inhibit the movement of calcium ions across the cell membrane, depressing both impulse formation (automaticity) and conduction velocity. The nurses’ role in the care of a child with AGN is crucial. Assess weight. Monitor daily weight to have a measurable account on the fluid elimination. Monitor intake and output. Monitor fluid intake and output every 4 hours to know progressing condition via glomerular filtration. Assess vital signs. Monitor BP and PR every hour to know progression of hypertension and basis for further nursing intervention or referral. Assess breath sounds. Assess for adventitious breath sounds to know for possible progression in the lungs. Ineffective breathing pattern related to the inflammatory process. Altered urinary elimination related to decreased bladder capacity or irritation secondary to infection. Excess fluid volume related to a decrease in regulatory mechanisms (renal failure) with the potential of water. Risk for infection related to a decrease in the immunological defense. Imbalanced nutrition less than body requirements related to anorexia, nausea, vomiting. Risk for impaired skin integrity related to edema and pruritus. Hyperthermia related to the ineffectiveness of thermoregulation secondary to infection. Excretion of excessive fluid through urination. Demonstration of behaviors that would help in excreting excessive fluids in the body. Improvement of distended abdominal girth. Participation and demonstration of various ways to achieve effective tissue perfusion. Activity. Bed rest should be maintained until acute symptoms and gross hematuria disappear. Prevent infection. The child must be protected from chilling and contact with people with infections. Monitor intake and output. Fluid intake and urinary output should be carefully monitored and recorded; special attention is needed to keep the intake within prescribed limits. Monitor BP. Blood pressure should be monitored regularly using the same arm and a properly fitting cuff. Monitor urine characteristics. The urine must be tested regularly for protein and hematuria using dipstick tests. When educating parents regarding known antecedent infections in acute glomerulonephritis, which of the following should the nurse cover? Option B: Impetigo, a bacterial infection of the skin, may be caused by streptococci and may precede acute glomerulonephritis. Although most streptococcal infections do not cause acute glomerulonephritis, when they do, a latent period of 10 to 14 days occur between the infection, usually of the skin (impetigo) or upper respiratory tract, and the onset of clinical manifestations. Options A, C, D: Scabies, herpes simplex, and varicella are not associated with acute glomerulonephritis. Nurse Jeremy is evaluating a client’s fluid intake and output record. Fluid intake and urine output should relate in which way? Fluid intake should be double the urine output. Fluid intake should be approximately equal to the urine output. Fluid intake should be half the urine output. Fluid intake should be inversely proportional to the urine output. Option B: Normally, fluid intake is approximately equal to the urine output. Any other relationship signals an abnormality. Option A: Fluid intake that is double the urine output indicates fluid retention Option C: Fluid intake that is half the urine output indicates dehydration. Option D: Normally, fluid intake isn’t inversely proportional to the urine output. Nurse Kai is evaluating a female child with acute post-streptococcal glomerulonephritis for signs of improvement. Which finding typically is the earliest sign of improvement? A: Increased urine output, a sign of improving kidney function, typically is the first sign that a child with acute post-streptococcal glomerulonephritis (APSGN) is improving. Options B, C, D: Increased appetite, an increased energy level, and decreased diarrhea are not specific to APSGN. A teen patient is admitted to the hospital by his physician who suspects a diagnosis of acute glomerulonephritis. Which of the following findings is consistent with this diagnosis? Note: More than one answer may be correct. Options A, B, and C: Acute glomerulonephritis is characterized by high urine specific gravity related to oliguria as well as dark “tea colored” urine caused by large amounts of red blood cells. Option D: There is periorbital edema, but generalized edema is seen in nephrotic syndrome, not acute glomerulonephritis. Which of the following conditions most commonly causes acute glomerulonephritis? Option B: Acute glomerulonephritis is most commonly caused by the immune response to a prior upper respiratory infection with group A Streptococcus. Options A, C, D: These are not common causes of acute glomerulonephritis. 1. When educating parents regarding known antecedent infections in acute glomerulonephritis, which of the following should the nurse cover? Option B: Impetigo, a bacterial infection of the skin, may be caused by streptococci and may precede acute glomerulonephritis. Although most streptococcal infections do not cause acute glomerulonephritis, when they do, a latent period of 10 to 14 days occur between the infection, usually of the skin (impetigo) or upper respiratory tract, and the onset of clinical manifestations. Options A, C, D: Scabies, herpes simplex, and varicella are not associated with acute glomerulonephritis. 2. Nurse Jeremy is evaluating a client’s fluid intake and output record. Fluid intake and urine output should relate in which way? 2. Answer: B. Fluid intake should be approximately equal to the urine output. Option B: Normally, fluid intake is approximately equal to the urine output. Any other relationship signals an abnormality. Option C: Fluid intake that is half the urine output indicates dehydration. Option D: Normally, fluid intake isn’t inversely proportional to the urine output. 3. Nurse Kai is evaluating a female child with acute post-streptococcal glomerulonephritis for signs of improvement. Which finding typically is the earliest sign of improvement? A: Increased urine output, a sign of improving kidney function, typically is the first sign that a child with acute post-streptococcal glomerulonephritis (APSGN) is improving. Options B, C, D: Increased appetite, an increased energy level, and decreased diarrhea are not specific to APSGN. 4. A teen patient is admitted to the hospital by his physician who suspects a diagnosis of acute glomerulonephritis. Which of the following findings is consistent with this diagnosis? Note: More than one answer may be correct. 4. Answers: A, B, and C.
Options A, B, and C: Acute glomerulonephritis is characterized by high urine specific gravity related to oliguria as well as dark “tea colored” urine caused by large amounts of red blood cells. Option D: There is periorbital edema, but generalized edema is seen in nephrotic syndrome, not acute glomerulonephritis. 5. Which of the following conditions most commonly causes acute glomerulonephritis? 5. Answer: B. Prior infection with group A Streptococcus within the past 10-14 days. Option B: Acute glomerulonephritis is most commonly caused by the immune response to a prior upper respiratory infection with group A Streptococcus. Options A, C, D: These are not common causes of acute glomerulonephritis.